There’s something undeniably enchanting about Jollydays. Having previously masterminded London’s stylish bar/restaurant and discreet celebrity hang-out CVO Firevault, husband-and-wife team Carolyn and Christian Van Outersterp opted to quit the city rat race and fulfill their dream of creating a better lifestyle for their family. The result is a sustainable campsite in the middle of a wood just 20 minutes from the historic centre of York. Comprised entirely of generously spaced pre-constructed bell tents, luxury lodge tents, and deluxe tents, this lovely 200-acre woodland site casts a calming spell upon you as soon as you enter its leafy embrace. Cars are parked off site to minimise disruption, and the tents are lovingly decorated with lots of colourful, retro touches like funky furniture, bunting, and ornaments. They’re fully equipped of course, with BBQs, picnic benches, wood-burners, and proper beds; the deluxe tents have en suite showers, loos, and kitchens. You’ll even find cool boxes, daily ice packs, loo roll, and washing-up liquid. A ‘cake’ tent full of home-made goodies and a communal campfire serve as public areas, and the Van Outersterps can arrange everything from archery and champagne picnics to woodcraft lessons. As for things to do in the area…well, there’s a whole bunch of options, including two national parks, several Areas of Outstanding Natural Beauty, a stunning heritage coastline, and of course beautiful York, with its wealth of attractions and charming atmosphere. Jollydays is snuggled within 15 acres of a 200-acre woodland. We have four poster beds, roll top baths, wood burners and candelabras to upgrade from the usual camping experience. Our tents have interiors from vintage styles to Kath Kidson decor to make you feel at home. We have a log store to keep our quality, quick lighting, kiln-dried wood dry (that has less than 20% moisture). Our shop has fresh cakes, games and essentials like a toothbrush or poncho in case you have left anything behind. 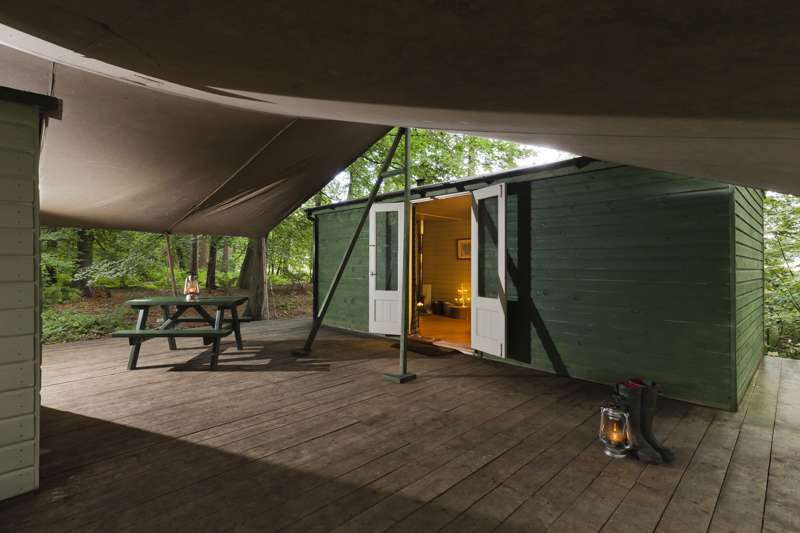 We have three Woodland Tents and eight Lodge Tents that sleep up to six people per tent. They include a four poster bed, two single beds and a sofa bed. They also include kitchen and bathroom cabins. We also have four Woodcutter Huts which sleep up to four people. Similar to a shepherd's hut they have a kingsize bed and a sofa beds and sole use of communal showers and toilets. After settling into your tent or hut, why not open a bottle of fizz, and make friends with other 'glampers' around our communal camp fire and toast marshmallows? Some guest like to go off site and explore the wonderful surroundings that Yorkshire has to offer. Others who don't feel like going very far, can relax with a book, or take a gentle stroll through the magical woodland. To help you make up your mind, why not check out our activities brochure on our website, where there is something for everyone on or off site. From Bush-craft, to theme parks to ballooning, there are lots of activities to try. If you want the luxury of not cooking whilst staying with us? You can order supper pots to be delivered to your tent and ready to eat. Or for large groups you can organise a caterer to come on site and cook for you. For latest availability and best prices for Jollydays Glamping, please use the Date Search above. A communal campfire is lit every evening. The pre-erected tents (8 Lodge Tents & 3 Woodland Tents) and 4 Woodcutter Huts are spread generously over 200 acres of woodland. Communal showers/toilets for the huts: 6 powerful showers and 2 washing-up areas; deluxe lodge for customers with disabilities. Rope swing and hammocks for kids; reception tent with tea and home-made cakes (honesty box); small shop selling everything from charcoal for BBQs to vintage cushions. Flamingo Land, a theme park, resort, and zoo will keep the kids busy, as will the high wires of Go Ape (08456 439215) in Dalby Forest. Castle Howard (01653 648333) is a magnificent 18th-century residence set within 1,000 acres of spectacular landscape; while York Maze (01904 607341) is a lot of fun (openJul–Sept only). The Yorkshire Wolds, Yorkshire Dales, North Yorkshire Moors and East Riding are all within easy reach, as are the charming seaside settings of Bridington, Hornsea and Scarborough. Click here for more activities, sights & attractions to see and do in York. Everything you need to know on what to do nearby and on site can be found in our activities brochure on the Jollydays website. Click here for more pubs, restaurants and places to eat & drink in York. Wekend stays from £325 depending on type of tent, season, and length of stay. Take the A166 (Stamford Bridge Road then Bridlington Road) from York; turn off left to Buttercrambe after passing Gate Helmsley on the way to Stamford Bridge. Follow the road for approx 1 mile, pass through the woodland, and the entrance is signposted down the lane, across a field. Bus no. 10 departs from just outside York railway station and will take you into Stamford Bridge; from there it’s around a 15-minute walk to the camp. Local taxis are also available.